If you thought Plebs couldn't get darker in tone than 'The Patron', you'd be wrong. It's hard to say whether this episode is just as dark, or even darker, since it combines a plot about having a creepy psychotic living in your house with, once again, the realities of ancient slavery, in which your only way to escape a master you don't want to work for is to get yourself kidnapped. I love the idea of basing an episode around the impulse purchase of a very creepy slave, because the idea seems reasonably plausible in an ancient setting, but isn't something the ancients themselves wrote about (because ancient literature always emphasizes the slave's subservience to his or her master and Romans would not feel comfortable depicting any free born Roman being frightened of his slave. If you started putting that in plays or literature, the slaves might get ideas. Literature always emphasizes the absolute authority of the master, even in plays about clever slaves or novels in which the master is in love with the slave - the cleverest slave will still be afraid of his elderly master having him beaten. And, of course, since masters could have their slaves beaten whenever they wanted, slaves themselves would be unlikely to behave in any way that would make their masters uncomfortable). Tim Key's performance is great, carefully playing comedy-unhinged in a character that's just creepy enough for the joke to work without being completely horrific - very much in the vein of Eddie from Friends. 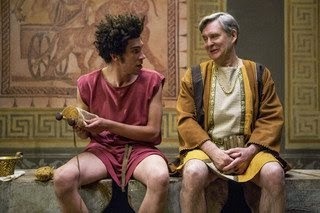 I also loved the way the episode addressed the fact that Grumio is, in fact, a pretty terrible slave, while at the same time showing that Marcus apparently does value Grumio enough (having presumably grown up together) to pay a lot of money to get him back after Grumio manages to get himself stolen and refuses to identify Marcus as his master. This, along with catching runaway slaves, is presumably why slaves in the real Roman world were often branded - and probably why slave-napping isn't something that comes up in ancient literature. The Romans were way ahead of their time when it comes to tagging your property - unfortunately in their case, the property in question was other human beings. 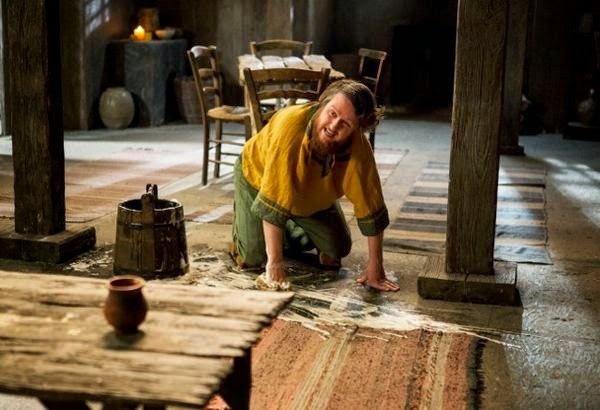 It's not hard to understand why Grumio was worried about having a very creepy fellow slave in the house, though putting yourself up for sale at the market is a pretty risky solution - goodness knows what sort of master you might end up with. But if Mushki attacked Grumio, the only result would be that Stylax would owe Marcus some money for damage to (or even the death of) his slave caused by Stylax's slave. On the other hand, if Mushki really went mad and killed Stylax, Grumio might be executed as well as Mushki, depending on whether they count as slaves within the same household (technically they have different masters, so he might be OK). Grumio may have felt he was better off taking his chances. Or, given that he's not very bright, he just hadn't thought through just how bad another master might end up being. I had a couple of pedantic nit-picks with this one, the main one being that Mushki's hat looked like a freedman's cap (as modeled in the picture here) - which, for obvious reasons, a slave would not wear. It's the sort of thing that can take you out of the episode a bit. And I'm pretty sure it was the Romans who brought rabbits to Britain, so, given that we're still pre-invasion, Cynthia probably shouldn't have had a pet rabbit. And isn't Metella Cynthia's slave? Why is she being invited to dinner with her mistress? But pedantic nit-picking aside, my main reservations are once again about the treatment of the female characters. I was a bit uncomfortable with the joke about leaving Metella's gag on, and even more so with the boys giving the psycho slave to Flavia, who may be a bit of a hard task-mistress who once tried to replace them with a furnace, but who hardly deserves to have a man who ties up and gags women knowingly placed in her home. That final scene felt really very dark to me, and not in a funny way. I enjoyed the episode overall, though, and it certainly made me laugh. I loved Water-Man correcting his name to Water-Boy on auto-pilot before realising he'd actually been addressed as Water-Man for once, and I especially loved the use of Latin plurals for the flowers (geranii, croci etc.). I liked the joke about Metella putting tomato sauce on everything as well, something I did for years (and Mushki being set off by people putting condiments on things reminded me of one of Kryten from Red Dwarf's craziest moments, thanks to which I can no longer hear the phrase 'brown sauce' without hearing Kryten yelling in my head "You want brown ketchup with lobster?!"). It's also another episode firmly based in the realities of ancient life. I confess to feeling actually slightly uncomfortable when we opened on the slave market (partly because I associate such a scene with the heroes being auctioned off in The Chronicles of Narnia's The Voyage of the Dawn Treader, possibly) and Stylax's comparison of buying a slave to buying an aubergine is, again, pretty dark - but these are the realities of life in a slave-owning society, and the sort of thing we rarely get to see in serious dramas set in the ancient world, in which it's necessary for the hero/protagonist to come across as rather more likeable and have a rather modern and forward-thinking attitude towards slaves and slavery (though Pullo in Rome is clearly the exception to that rule). Sometimes, you need the broad scope and surreal tone of a sitcom to deal with material like this. How's this for a comedy pitch: in a society with a particularly high slave population and no free healthcare, a man refuses to pay for the treatment his slave needs, leaving the slave to die to save some money. That's some pretty black comedy right there, probably the blackest Plebs has done since Marcus more or less killed a man in series one's 'The Gladiator'. It basically works, but I must say I came out of this episode finally convinced of something I'd been thinking for a while, which is that Stylax is much, much nicer than Marcus. Stylax is a bit daft, but here he pays for his friend's slave's medicine out of his own pocket and grovels all over the place to both Flavia and Gaius in an attempt to get enough money to pay for Marcus' as well. Marcus, meanwhile, refuses to pay for medicine for his own slave and expects his friend to prostitute himself to get some when he needs it. Cynthia deserves better. Much better. There's a tendency for modern writers sometimes to assume that people in the ancient world were faced with a choice when ill, of whether to pray to the gods and carry out religious or superstitious rituals, or rely on physicians and medicine. I have to admit, normally, this rather annoys me - I suspect the vast majority of people would simply do both, just as most religious people today tend to pray for health and recovery while also seeing doctors and getting scientific medical treatment. However, there were probably some people who tended to rely more on one or the other, so Cynthia's preference for religious ritual seems perfectly reasonable, and of course Marcus has other motivations. The religious option wouldn't normally be cheaper - sleeping in an incubation sanctuary and praying for a healing dream, for example, required one to buy an animal to sacrifice before sleeping on its fleece, pay the priests and leave a substantial gift for the temple if it worked (the priests made sure to put up inscriptions noting that, for example, when one man was cured of blindness at Epidauros but didn't bring the thank offerings to the god Asclepius, the god made him blind again until he came back, presumably bringing the thank offerings this time). Cynthia's chosen ritual to the goddess Hygeia (daughter of Asclepius) sounds surprisingly cheap and short on animal sacrifice, however - and of course, Marcus' primary interest is in trying to get Cynthia to go out with him, which somewhat surprisingly nearly works. The episode's other main plot is fairly black comedy as well, involving potential sexual harassment and a character trying to decide whether they should sell themselves to further their career. Between this and Bad Education, I'll never be able to look at Hugo from The Vicar of Dibley (or Tom from Four Weddings and a Funeral) the same way again. It was very funny though, and firmly based in real ancient Roman society, in which wealthy men acted as patrons for smaller businesses and clients. Black though the comedy may have been, this episode was also very funny, and the make-up on the sick characters was impressive. I also loved the opening scene, set in a Roman toilet - which really were exactly like that (though surely no one would share sponge sticks - that's even worse than using someone's toothbrush...). I couldn't help thinking of The Roman Mystery Scrolls, the only other series I'm familiar with to set so much action in an accurately-depicted toilet, and author Caroline Lawrence's favourite prop, the sponge stick. The only other time I remember seeing a Roman toilet accurately depicted in a drama was a brief scene in Spartacus: Gods of the Arena, but there are other... distractions that may prevent viewers from paying much attention to the toilets in Spartacus. It's amazing the comic potential of the Romans' fondness for communal pooing hasn't been exploited more often. What I loved about this episode was that everything in it came straight out of the ancient world. I can think of hardly anything that was contemporary in it - Landlord's life insurance scam was more modern (no life insurance in ancient Rome), but even that relied on Grumio not understanding the concept. (I'm also not sure why some of Flavia's costumes have looked sort of kimono-y lately, but I like it, it's a good look on her). Some things, like Marcus trying to get Cynthia to go out with him, are timeless, and when Gaius sat far too close to Stylax in the toilet I was reminded of people who sit unnecessarily close to someone else on the bus or in church, but most of this story could only have taken place in ancient Rome. Plus it was very funny. If only Metella could be given something to do other than being the only sane person on the block, but I suppose we can't have everything, and that shouldn't take away from how enjoyable this half hour was.